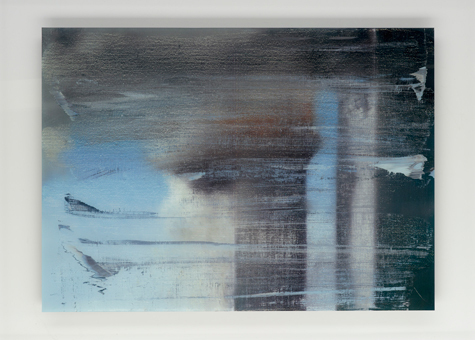 Today is the 10th anniversary of 9/11, and in memory of that day we want to share a recent addition to the DMA’s collection, September, a print by Gerhard Richter. Richter was on a Lufthansa flight to New York from his home in Cologne when the Twin Towers and the Pentagon were attacked. He was traveling to New York for the September 13 opening of his exhibition at the Marian Goodman Gallery; his plane was forced to land in Halifax and he was able to return to Germany a couple of days later. Richter nearly witnessed the attacks, but in the end he only experienced them, as did the rest of the world, through images. Throughout his long career, Richter has confronted in his work the most charged and painful issues of our day. His art has always suggested that imagery, photographic imagery in particular, carries an unbearable burden of how we perceive our world. This print of Richter’s September painting provides us with minimal information to register the subject, yet a further clue is given by the title. I had to look at it a while to see what it was, but then ‘WOW’. It’s beautiful.and yet sad.